1. Didn't buy enough buttons, had to go to 2 JoAnn's. 2. Cut the yoke off because I didn't think I needed it and that in turn made the sleeves and the collar wrong. 3. Once I figured out the yoke and sewed on the sleeves the pattern was facing the WRONG direction on one of the sleeves. Had to buy an extra yard of fabric to fix the sleeves. 5. Bought the wrong kind of ribbon for the belt! Had to sub white which I think looks terrible! Needless to say I'll be shortening this dress as well. Just not right now as I'm just cooling down from the Sears catastrophe and I'm also getting over a nasty sinus infection. I have one outfit to wear tomorrow that's not a repeater. Another when my shoes get here and two in the queue. I'll probably fix it Monday depending on how I feel being back at work. I'll keep you updated on this yuck. Cute fabric. I feel your pain. 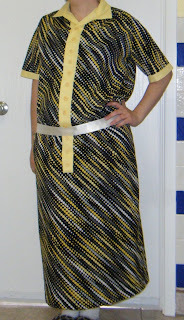 Maybe you can make an extra belt out of the hem fabric you cut off? You could still find another ribbon color as well, and have two belts. The remix shoes are SO adorable. I want a pair too, but would never pay the regular price. Thanks for the tip! Let me know how they fit!